Thank you for joining me as we count down to this very special MFT release. We are four days away from the big day! All the new Stamps, Die-namics, and Stencils will be available on Tuesday, August 2 at 10:00 pm EST. Be sure to check out the MFT Blog to see all the new items being revealed today. Don't forget to leave a comment on the MFT Blog countdown posts, YOU could win one of the five $75.00 gift vouchers. We have such a fun release in store for you this month! Today I have a fabulous monster card to share with you. It features the Monster Love stamp set and Die-namics. This set is seriously cute! I stamped these fabulous monsters in s few of my favourite bright colors of Premium Dye Ink. A couple of the monsters are popped up to create a little extra dimension. 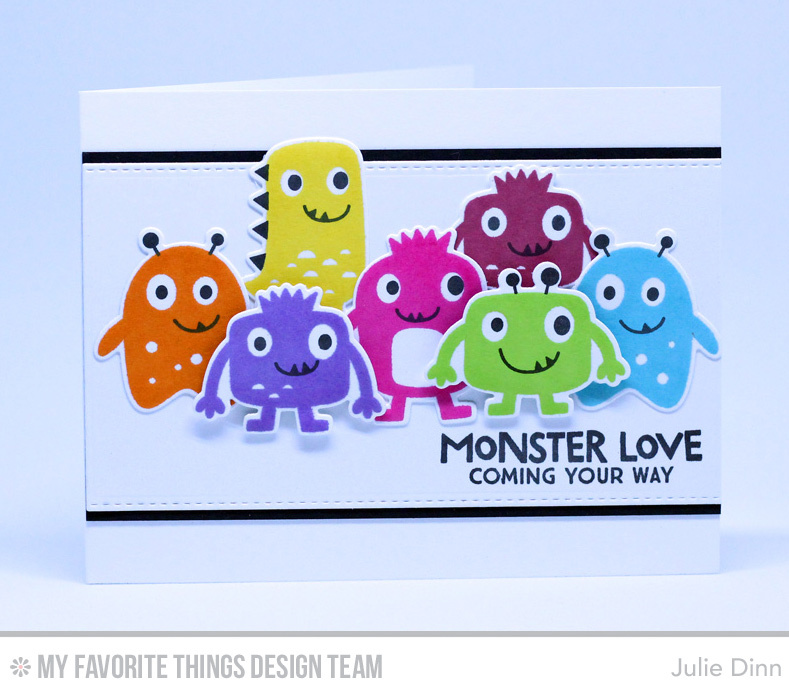 The sentiment is one of the many fabulous ones that are included in the Monster Love stamp set. I can't stand it. These monsters are way TOO CUTE. They need to come live here at my house. Such a cute card, love your little stamped monsters in the rainbow of colors. I love the sweet monsters! Cute card. I like that Blueprint design that embosses the stitched line on 2 sides. Love those colorful little monsters!! These little monsters are so cute. Love how colorful you made them. Thanks for sharing. Those are the cutest monsters I have ever seen. LOL I love your card. So cute and so colorful! Great idea! so pretty card with this little monsters!